Are you ready for a Photoshop book that breaks all the rules? Updated for Adobe Photoshop CS3, this top-selling book breaks new ground by doing something for digital photographers that's rare--it cuts through the bull and shows readers exactly "how to do it." It's not a bunch of theory; it doesn't challenge readers to come up with their own settings or figure it out on their own. Instead, it shows them, step by step, the exact techniques used by today's cutting-edge digital photographers and retouchers, and it does something that virtually no other Photoshop book has ever done--it tells you flat-out which settings to use, when to use them, and why. Including coverage of all the newest features of CS3--such as nondestructive Smart Filters, Vanishing Point with Adustable Perspective Planes, Automatic Layer Alignment and Blending, and a streamlined interface--The Photoshop CS3 Book for Digital Photographers is full-color, graphically rich, and contains project-based examples of every key step in the digital photography editing process. 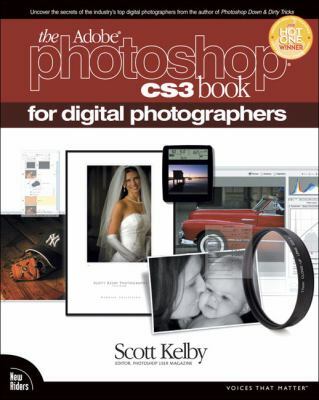 Integrating all the newest features of Photoshop CS3 into the book's workflow, Scott shows readers how to work with their images like a pro, from importing to organization to correction to output. Readers will learn all they need to know to create stellar images using Photoshop CS3.Kelby, Scott is the author of 'The Adobe Photoshop CS3 Book for Digital Photographers', published 2007 under ISBN 9780321501912 and ISBN 0321501918.